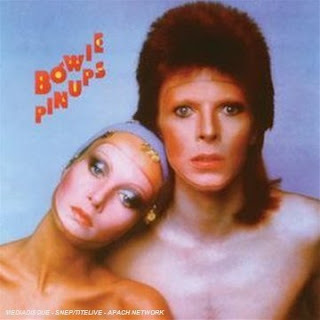 Atomic Sourpuss: A Godawful Small Affair: Six "Pin Ups"
The thing with Bowie is he always keep you guessing. Someone in my position can only imagine how nonplussed the record buying public may or may not have been when he dropped an album of cover songs less than a year after "Aladdin Sane", particularly when we're talking about songs that were out in the preceding decade or so. And so it is that from the more ambitious offerings of that aforementioned body, not six months later we get an album of mainly passable, occasionally cringeworthy rock 'n' roll songs, sung by somebody who is reasonably unmistakable as one of Britain's biggest pop stars of the era. If nothing else, it's certainly out there enough to bear the Bowie fingerprint, but even by his rich standards this must be considered quite the deviation. So what's actually on there? Bit of Who, bit of Kinks, bit of Pink Floyd (Liverpool's favourite band - FACT), and yet despite being good songs by good artists being covered by good musicians, it's not very... Well, good, I suppose. It's not that the song selections are bad, and nothing's totally terrible (slowed-down "I Can't Explain" aside) but everything just seems a bit limp and phoned in - one might as well just dig out the originals, as not much is added to or subtracted from them. But the major complaint is that none of this is strictly necessary; that alone doesn't make it a bad album, or an invalid artistic statement, but it does mean that it seems like simply a lesser quality of work, particularly when juxtaposed with the albums on either side of it chronologically. It also seems like a sad goodbye to Ronson and co., who we shan't be hearing from again any time soon. One wonders if the whole thing was a contractual obligation of sort, either to his musicians or the record company. As with most of his career moves, it doesn't appear to have done him much harm in the long run. Think of this as more of a musical sorbet - a sharp break between courses, there to clear the palate of the Spiders From Mars before the more esoteric offerings to come. I think I've nicked that concept from the "Fist Of Fun" comedy cash-in book; still, the reference endures. Join us next time for a wonderful trip to Murder City. Mmm - sounds relaxing!